Ash’s Magic Shop Everyday is April Fool’s Day at this tiny Lincoln Square shop, which is packed to the gills with every trick in the book. You’ll also find a large selection of clown supplies including makeup, wigs, costumes, juggling supplies and gags. Be sure to take advantage of the shop’s spring magic sale, which features thousands of beginner and advanced magic tricks for $1 each. 4955 N Western Ave (773-271-4030). El: Brown to Western. Bus: 11, 49, 81, 92. Noon–6pm daily. Enjoy: An Urban General Store This Lincoln Square gift store has a strong focus on gag, humor and novelty gifts (the rest of the store is devoted to children’s items). Stock up on classics such as The Little Devil’s Trick of the Day set ($10), which includes a week’s worth of gags like a hand buzzer and whoopee cushion. 4723 N Lincoln Ave (773-334-8626). El: Brown to Western. Bus: 11, 49. Mon–Fri 10am–7pm; Sat 10am–6pm; Sun 10am–5pm. OhNo!Doom Gallery + Shop Formerly located in Logan Square, this street-art and vinyl-toy emporium moved in January to Wicker Park, where you can find a variety of kooky items including a Rocket World plush polar bear costume/hoodie ($179), plush toys by FluffyYukYuk and Lisa Crooks ($18–$20) and graphic T-shirts ($15–$25). 1800 N Milwaukee Ave (773-698-8348). El: Blue to Damen. Bus: 49, 56, 72. Tue, Thu 4–10pm; Sat noon–7pm. Threadless There’s no question that graphic T-shirts from this website are quirky—and the weekly rotating selection at its brick-and-mortar store is just as fun. Classic T-shirts in the past have included one that reads “MEAT IS MURDER. TASTY MURDER.” and another featuring a clown puking up a rainbow in the toilet. 3011 N Broadway (773-525-8640). El: Brown, Purple (rush hrs) to Wellington. Bus: 22, 36, 77, 151. Mon–Sat 11am–8pm; Sun noon–6pm. 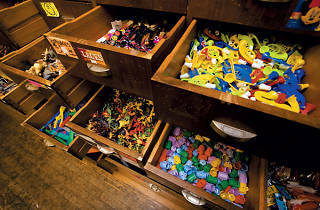 Uncle Fun This wacky little Lakeview shop is packed with quirky sundries that don’t do much—except make you laugh. It’s likely one of the city’s few retail establishments that sees a spike in sales around April 1. 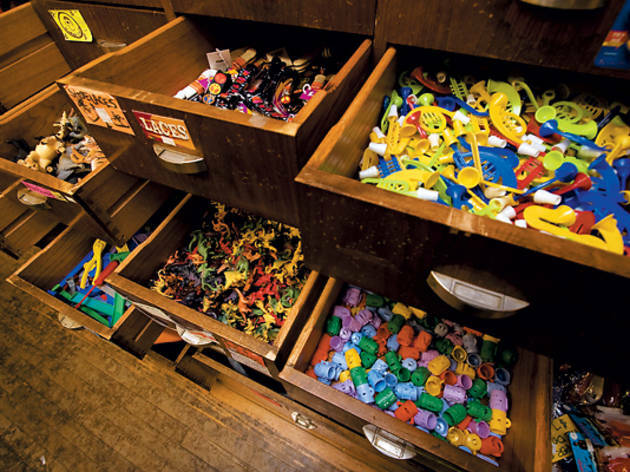 Scattered amid the cramped aisles are plenty of pranks—some clever, some dopey—and miscellaneous toys and tchotchkes that simply make people happy, such as bobbleheads and PEZ dispensers. Store manager Billy McCall says the remote-controlled fart machines always sell well. “It’s the whoopee cushion of the new millennium,” he says. 1338 W Belmont Ave (773-477-8223). El: Brown, Puple (rush hrs), Red to Belmont. Bus: 9, 77. Mon–Fri noon–7pm; Sat 11am–7pm; Sun 11am–5pm.